Words and, subsequently, language apparently originated 100,000 to 300,000 years ago. A long time by most reckoning; but, in evolutionary terms, just an eyeblink. The span of years is long enough to satisfy most linguist that some form of evolution took place. Perhaps that should read 'is taking place'. Language continues to evolve. Biological speciation, the development through evolution of homo sapiens, seems a logical first step. The larynx of humans is peculiar to our species and is a considerable factor in our ability to speak. Speech, it is, that sets us apart from all other species. This, at least, is the prevailing wisdom. The problem of origin of a proto-language may never be solved to anyone's satisfaction. Too little data. On the other hand, the differentiation of language does lend itself to examination, and some conclusion may yet be reached on why so many different languages come to be spoken. Theoretical conclusions abound; consensus remains elusive. In 1861, speculation by one Max Muller produced the following theories: bow-wow theory, pooh-pooh, ding-dong, and yo-he-ho. Muller's notions are today considered a bit naive, though imitation of animal sounds, emotional interjections, echoing natural frequencies, and collective rhythmic labor all seem to play some small role in the more complex theoretical musings of today. Currently, there are a dozen or so theories concerning the origin of words and language. Many of these build on the simplistic ideas of Muller. One does argue that there can be no 'theory of the origins of language' (social anthropologist Roy Rappaport). The argument considers language not as a separate adaptation, but as just one facet of the symbolic cultural development of humans. Carried further, such an argument might be used to argue that the language of homo sapiens is not a blessing but a curse. Future posts will explore this notion. 1Dawkins, R (1976). 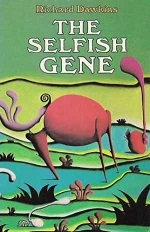 The Selfish Gene. Oxford University Press, New York. pp69-70.